If your browsers have been hijacked, it is very likely that the Browserhome.net browser hijacker has entered your PC. The first symptom that it is inside your computer is the presence of an unknown search engine and homepage. Your New Tab URL might be changed as well. From the moment of the infiltration of a browser hijacker, your homepage, search engine, and the New Tab page will lead to Browserhome.net. 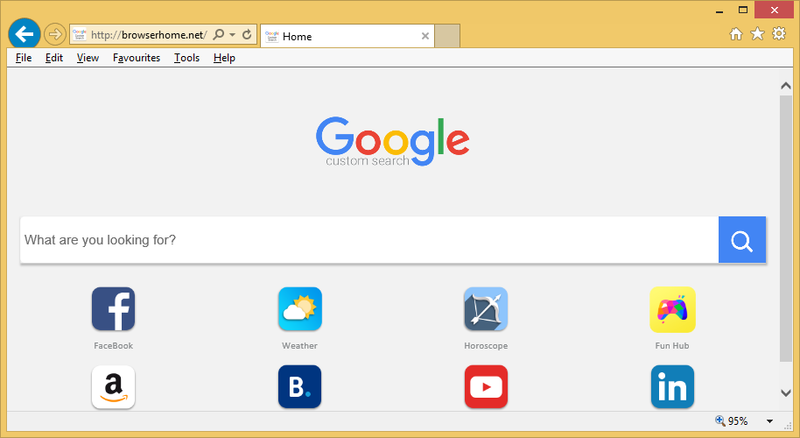 At first glance, Browserhome.net does not look like a bad website, so users do not think that it can cause harm to their computers and thus they do not hurry to remove Browserhome.net. We agree that this web page does not differ from other search tools the way it looks; however, our research has clearly shown that this web page might put your system into danger during the time. Actually, you might even experience identity theft. Last but not least, you will not be able to change the settings of your Internet Explorer, Google Chrome, and Mozilla Firefox browsers unless you uninstall Browserhome.net browser hijacker fully from your computer. We know that it might be hard to eliminate it, so we have decided to focus on its removal after we explain to you why it is so important to get rid of it. Browserhome.net really looks like a good website; however, in reality, it provides users with all kinds of advertisements. If there is the search box on its start page, you should not use it either because it will provide you with the sponsored search results. Browserhome.net shows all these commercials for users because its main goal is to promote third-party websites and thus generate revenue for the developer. What you will get out of this is the presence of malicious software only. Yes, you might quickly allow malware to enter your PC if you click on those sponsored links you are provided with. We also want to emphasize that your privacy might be violated and you might even experience the identity theft if you keep Browserhome.net and allow it to collect information about you. Unfortunately, you will not be able to change this webpage, so the only way to stop it from acting like this is to uninstall Browserhome.net fully from all the browsers. Once you are done with this threat, you will be allowed to set the homepage, search engine, and the New Tab page you like. How did Browserhome.net enter my computer? Even though browser hijackers are not as dangerous as Trojans, ransomware, and similar threats, they enter computers exactly like these threats, i.e. they enter computers without permission. As researchers have found, Browserhome.net and similar threats often travel as components in software bundles and thus enter computers without permission together with other applications, usually freeware. If you are an inexperienced user, you might find it really hard to prevent browser hijackers and other threats from entering your PC, so we believe that you should immediately install a security tool after you delete Browserhome.net. What is more, it would be really nice if you always download programs from their official websites. Of course, in some cases websites of unreliable software seem to be perfectly decent, so the automatic security tool is still a must. How can I delete Browserhome.net? Browser hijackers are threats that might be hard to erase. Therefore, you should not expect to remove Browserhome.net very easily. Of course, you can get rid of this infection manually by using instructions which you will find below this article. As you can see, you will have to reset your browsers to their default settings and remove the hijacker via Control Panel. If you find it too hard to implement the manual Browserhome.net removal alone, acquire a scanner that can be fully trusted and then scan your system with it. Such a tool will delete ALL the threats in seconds.